U.S. Department of Housing and Urban Development (HUD) Public and Indian Housing, Real Estate Assessment Center (PIH-REAC) lacked a standardized, automated inspection solution for conducting full or quality assurance Section 8 Housing Quality Standards inspections. PIH’s mission is to ensure safe, decent, and affordable housing; create opportunities for residents’ self-sufficiency and economic independence; and assure fiscal integrity by all program participants. REAC’s mission is to provide and promote the effective use of accurate, timely and reliable information assessing the condition of HUD’s portfolio; to provide information to help ensure safe, decent and affordable housing; and to restore the public trust by identifying fraud, abuse and waste of HUD resources. Delivered Lightning Fast, On Time and On Budget – The Extensible Assessment Manager met HUD’s requirements and delivered a live application in just 6 weeks after award. Mobile – This application was mobile out-of-the-box. There was no need create a separate mobile application. What works on the computer works on a tablet/phone with no additional development. Reporting – Simple and easy to use reporting and dashboarding gives HUD instant visibility into the inspection and audit process. Scalability – The Salesforce cloud-based environment instantly scaled to 100 inspectors for more than 18,000 inspections. The underlying platform can handle tens of thousands of users and tens of millions of inspections. We are totally committed to getting you across the finish line on time. Transform your organization in days and weeks not months and years. Ask about out Cloud Transformation Program, the simple six week program that gets your business process transformed seamlessly. 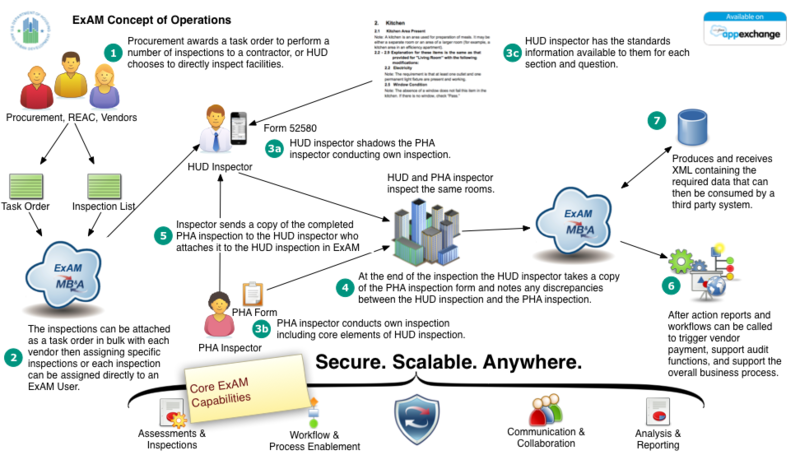 Built on the Salesforce1 platform ExAM takes your inspections where ever you need them. Open APIs mean ExAM can connect into your existing operations seamlessly. Want ExAM in the FedRAMP friendly Gov Cloud environment? No problem we are already there. Have really complex public sector inspection requirements? ExAM is both powerful enough and flexible enough to help you create an end to end inspection process with everything you need.